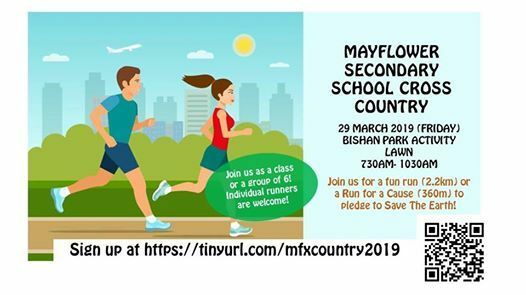 Parents and Alumni of Mayflower Secondary School, you are cordially invited to join us at our annual Cross Country Run on 29 March 2019 (Friday) from 730am to 1030am. Objectives: To get the members of Mayflower family to participate in a school event and interact with each other in an outdoor setting. 2) Competitive Run for teachers (3.2km) - Parents and Alumni are welcome! 3) Fun Run for students and teachers (2.2km) - Parents and Alumni are welcome! 5) Relay for a Cause (360 runners in total, 360m/runner within 60mins) in line with the message of Saving the Earth ( https://www.360fortheplanet.org) - Parents and Alumni are encouraged to join as a group of 6. Individual runners are also welcome! For more clarifications, you may contact Mrs Marie Huang at bGVlX21pYW9fcWluZ19tYXJpZSB8IG1vZSAhIGVkdSAhIHNn or 6457 7783.